Asteroids are different from comets. They are like small pieces of planets. Some asteroids that orbit planets are even considered moons. One of the moons of Mars (Deimos) is only four miles across. 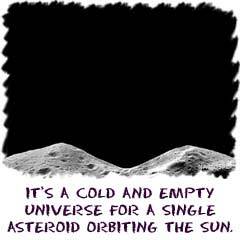 In our Solar System, you will find asteroids orbiting the Sun in a regular orbit (not like comets, which have stretched elliptical orbits). There is also an Asteroid Belt between the orbits of Mars and Jupiter. The belt holds small pieces of rock that spin around the Sun in a specific orbit. It is almost like a planet that never formed. Asteroids are made of rocks and metals. Some astronomers consider them to be minor planets (like the moons of Mars and Saturn). Most asteroids are very small but they do have gravity and can affect any objects that come too close. The more iron (Fe) and nickel (Ni) in the makeup of an asteroid, the greater its mass (and gravity). Scientists also use the amount of metal in asteroid classification. Using an infrared sensor, asteroids are classified as light or dark. The lighter ones have more metal than the darker ones. Beyond our Solar System, asteroids travel through the galaxy from system to system. These asteroids do not necessarily orbit a star but stars influence their direction and speed. Many astronomers believe that asteroids are pieces from the origins of the universe. Some asteroids were large enough and lucky enough to combine with others and form planets. Some asteroids just continued their existence floating through the universe. Chances are the Earth doesn't have to worry about a collision with a comet. Asteroids are another matter. Scientists already think that a large asteroid may have hit the Earth when the dinosaurs were alive. That collision may have changed our atmosphere and led to the extinction of the dinosaurs. We just told you about that asteroid belt just outside Mars' orbit. There may come a day when one of those asteroids drops out of orbit (maybe from a collision with another asteroid) and heads toward Earth. If it is small enough, it will burn up in the atmosphere. Larger ones will hit the surface of the planet. Hundreds of millions of years ago, collisions with asteroids happened more often. Over time, the number of asteroids in the path of the Earth decreased and collisions became less frequent. * The custom search only looks at Rader's sites. Go for site help or a list of astronomy topics at the site map! ** Andrew Rader Studios does not monitor or review the content available at these web sites. They are paid advertisements and neither partners nor recommended web sites.